Years later, a condemned murderer, who claims he was abandoned by the CIA, and who starred in an early episode of Bullseye, is finally executed for killing two supposed Soviet spies back in the 1970s. Jake Boxer, still trying to piece his life back together, is on his honeymoon in a posh ski resort in the Alaskan mountains when he gets word of the inmate's execution...and the old killer's final words: "The good spy dies twice". Those five words, seemingly meant for Jake, draw the ex-reporter out of his forced retirement and into a complex and deadly global conspiracy involving his newlywed wife, the secretive New World Order, and the hotel's 100 or so guests. The Good Spy Dies Twice is an action-packed, psychological thriller that never lets up. Jack Boxer is a newlywed, ex-investigative journalist and ex-host of Bullseye as well as a man tortured by the death of his sound man. Add in the Cold War, double agents, a lost painting and greed to complete the psychological thrill and mystery of this book. Recovering from a nervous breakdown, Jack comes face to face with espionage and the New World Order in Alaska at an isolated ski resort. Having lost his sound man to the New World Order and espionage, Jack is taken by surprise when he discovers his new wife is neck-deep in spying where she texts him the same words as a recently executed killer. Jack discovers that Claire (his wife) is writing an earth shattering news story that is Bullseye worthy. Trapped in a closed resort facing starvation, starving wolves and members of the New World Order, Jack is left to save the day. Can he get those few left with him to a safe place before the bomb arrives or will they all meet the same fate as his sound man? Recovering from a near death experience and crippled with a broken back, Jack pushes forward to tell the world. Mark Hosack creates a world where the Cold War still exists and there are mind-blowing twists and turns in this thriller that keeps the listener mesmerized. 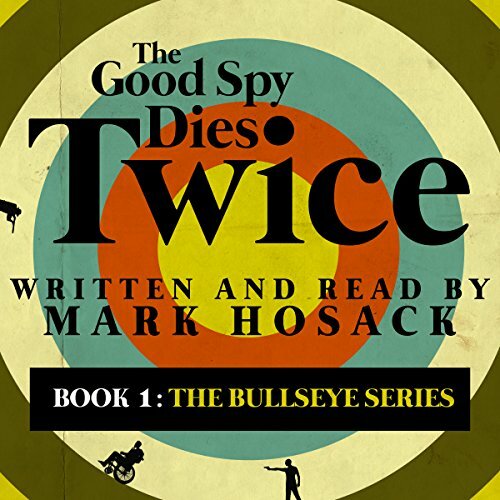 The Good Spy Dies Twice is a well-written plot with characters that are developed in a realistic way. The situations that Jack finds himself are realistic as well. Hosack describes the helplessness of Jack not being able to find Claire to the possibility of being wolf food in a vivid and detailed style. Hosack does an excellent job of tying everything together and in growing Jack into a character that connects to the listeners. The narrator, also the author Mark Hosack does his novel justice as the listener is treated to a passionate performance and the smooth flow of a narrator connecting to the story. He speaks clearly and concisely. His passion, excitement, doubt, fear, pain and more are portrayed in a riveting performance. While this story kept me riveted and entertained I can certainly understand why some may find it tedious. Most of all you should know it's good enough for me to purchase the coming sequel. For all it's good aspects there are several glaring flaws. The author is a good narrator, but he and the producer made the huge mistake of using sound effects and music introducing every chapter. It not only is distracting, but it takes away from an otherwise good performance. If the story is good, it needs nothing but a good narrator. The second is not a flaw at all. Our hero is a former investigative journalist and star of a once popular show entitled Bullseye. He is now disgraced, having fallen victim to paranoia. This paranoia is a continuous thread that permeates his thought process. It is as exhausting to read about as it is to actually live through. My last criticism is that the author does a poor job of explaining who the villain is and especially revealing his demise. In the end it is indeed an excellent mystery, worthy of your time. What did you love best about The Good Spy Dies Twice? The Good Spy Dies Twice was a riveting spy novel, perfect for the conspiracy theorists. I was hook on page one. The author weaves a fantastic tale of global espionage. Every one has a secret and no one is whom they appear in this story I was glued to the story and shocked by the outcome. My favorite character was the MC, Jake Boxer. He is like a dog with a bone when he gets on the trail of a story. Pure genius! Have you listened to any of Mark Hosack’s other performances before? How does this one compare? I have not listened to any other of Mark Hosack's performances but I am definitely adding him to my list. Mark did a wonderful job with narrating the story. The added sound effects and music interludes at the being of each chapter was a unique aspect and set the tone of the chapter. I look forward to reading and listening to other books by Mark Hosack. Authors voice is so engaging and leaves you wanting more of his books on tape. A wonderful thriller with twists and turns you didn't see coming. As a fan of Mark Hosack's books I was prepared for twists and still didn't see them coming. What about Mark Hosack’s performance did you like? Mark's voice is perfect for this on edge thrill seeker, deep voice keeps you alert. I wish, with kids and a full time job, I couldn't make this happen, but I would have likes to.